^ a b 安倍昭恵 2008, p. 32. ^ a b 安倍昭恵 2008, p. 29. ^ a b c d 小川栄太郎 2012. ^ a b c 安倍昭恵 2008, p. 30. ^ a b 安倍昭恵 2008, p. 28. ^ a b c 小川榮太郎 2012. ^ “完全保存版 著名人たちが明かす「私の名医」 いい医者に会えてよかった!”. 週刊現代 (講談社). (2011-10-22). http://gendai.ismedia.jp/articles/-/22877?page=4 2012年9月27日閲覧。. 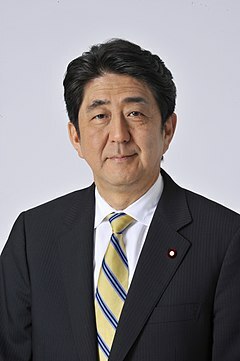 ^ 尖閣　見解相違認める　日本側譲歩　日中首脳会談へ Archived 2014年11月9日, at the Wayback Machine. ^ 金曜アンテナ 2014年4月11日 Archived 2016年3月4日, at the Wayback Machine. ^ 閣議決定 Archived 2013年5月16日, at the Wayback Machine. ^ 英: I feel deeply sorry that they were forced to be placed in such extremely painful situations. ^ 英: We feel responsible for having forced these women to go through that hardship and pain as comfort women under the circumstances at the time. ^ 菅直人元首相が控訴 メルマガ訴訟　京都新聞　2015年12月3日 Archived 2015年12月20日, at the Wayback Machine. ^ 野上忠興 2004, p. 44. ^ 神一行 2002, p. 216-217. ^ 山際澄夫 2003, p. 116-118. ^ 山際澄夫 2003, p. 12/93-95.